Waiting with my husband in the emergency room this morning (he's okay), I noticed three signs on the wall of the exam room, typed on 8 1/2" x 11" paper in 12- to 14-point font. They were placed opposite the bed. One sign read, "Our Promise to You;" the second one was a handout with information for waiting patients; the third was titled, "Please Help Us Help You" and went on with a list of suggestions, like minimizing trips back and forth to the waiting room and having only one family member visiting at a time. What struck me about these signs was that there was no way the patient could possibly read them from the bed. There was no way I could read them from the chair I was sitting in. Did the hospital really expect a sick or injured patient or concerned family member to get up and walk over to read the signs (which I'm sure were very helpful and informative)? This reminded me of a typical PowerPoint slide show with a lot of bullets and text. The speaker hasn't taken one second to determine whether the audience can actually read the words on the slides, because he's been so concerned about making sure all the text can fit. He's concerned about saying everything he could possibly say on each slide, but is not concerned about whether there is any value to the audience in those slides. 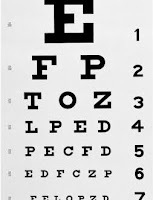 While sitting in the exam room, I imagined large, colorful posters replacing the signs. I pictured shortened sentences which were simple and clear. I pictured graphics and images to help them make their message clear, even to people who don't speak English or who are visually impaired. If the hospital really cares about people reading those documents, they need to make them patient-friendly, easy to see, and quick to digest from afar. If you really care about your audience getting value from your slides, you need to rethink the small text and multiple-bullet approach. On another note- I'm glad your husband is ok.